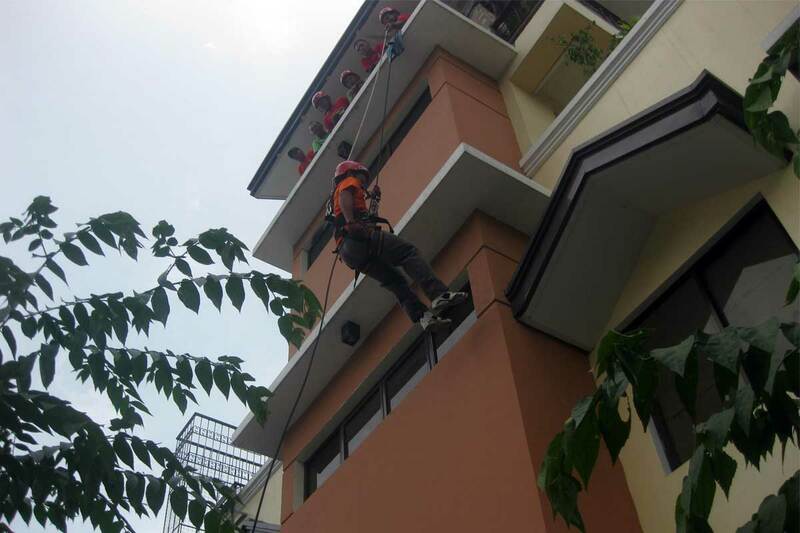 ERPAT dad Heracleo practices rappelling down a building, which could help him rescue others in case of earthquakes or fires. Fathers are expected to be many things. They are expected to be providers, teachers, moral exemplars, and to strike the delicate balance between protecting their children and preparing them for life in a sometimes harsh world. Responsible fatherhood is difficult, which is why those dads who dedicate themselves to being honorable, life-giving fathers deserve to be applauded. More than that, they deserve to be supported. Support is especially important for fathers living in poverty. These dads, because they lack material resources, often find themselves in the heartbreaking position of not being able to serve their families as they’d like. They are hindered from providing things for their children that other fathers take for granted, like adequate food, decent housing, and basic education and health care. Unbound recognizes that we have a particular role in helping to build up fathers and mothers who struggle to provide for their families. We’ve learned over the years that what they need from us is not to take over their lives or do for them what they wish to do for themselves. Rather, our role is to help clear a path for these families toward self-sufficiency, and then let them walk it at their own pace. One of the greatest assets we’ve discovered is community-based support groups for the parents of sponsored children. These groups have become a hallmark of Unbound programs throughout the world. Most are still made up predominantly of mothers, but fathers groups are becoming increasingly vital in the communities where we work. Nowhere is this more evident than in the Philippines, where the tradition of ‘ERPAT’ groups has become a valuable part of Filipino society. Coming from a Tagalog word meaning ‘dad,’ ERPAT is an acronym for ‘Empowerment and Reaffirmation of Paternal Abilities.’ They are groups of men who come together to serve their local communities in a variety of ways. Unbound communities in the Philippines have taken the concept of the ERPAT group and made it their own. The men in these groups are the fathers of sponsored children, and they have in common their own struggles with poverty. Among other things, the Unbound ERPAT groups have developed new livelihood programs, contributed to environmental initiatives and provided security for large Unbound events. Emmanuel, along with other ERPAT fathers, gets ready to take part in water rescue training with the Philippine coast guard. A member of the Philippine coast guard shows an ERPAT father proper safety techniques for water rescues, which are sometimes needed due to frequent flooding in the Philippines. One of the most significant contributions of the Unbound ERPAT groups has been training and mobilizing as emergency responders in times of natural disaster. This is especially important considering the frequent flooding that takes place in the Philippines due to monsoonal rains and typhoons, and the high number of sponsored families living in areas prone to flooding. 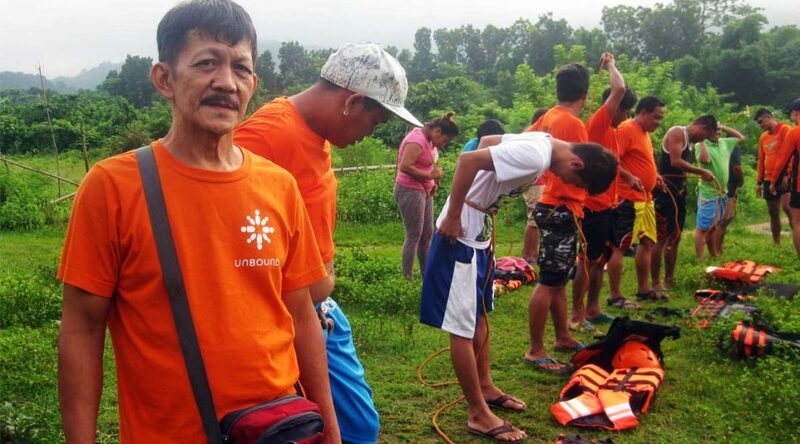 In Unbound’s Antipolo program, east of Metro Manila, ERPAT fathers have been undergoing extensive water rescue training on the Daraitan River. The training, called ‘River Crossing Rescue,’ is one in a series of courses they’ve taken on disaster management. It was conducted by the Philippine Coast Guard and is aimed at proving basic skills for rescuing people trapped by rising waters. Now that the Philippines has entered the rainy season, the ERPAT dads trained in water rescue will be keeping a close eye on the weather. Like all people living in places susceptible to the ravages of nature, they hope for the best and prepare for the worst. The water rescue training is one example of fathers choosing not to be victimized by their environment or the circumstances of their lives, but coming together to do what they can to protect their families and communities. We salute these men, just as we do all the dads throughout the Unbound world who work hard and make untold sacrifices for those they love.